It's been a flurry of fun announcements all week long, right? Today we are bringing aboard another new stamp illustrator, some of you may have heard of her, Holly Brooke Jones! Raise your hand if you are familiar with Holly's work! I've always been a big fan of Holly's work and am thrilled to have her continue designing stamps with Mama Elephant! Check out some fun things you can do with those timeless snowflakes! Also new to this release are these adorable boxes named Scallop Square Box. It cuts out one piece at a time and you just fit them together to form a closed box. And those snowflakes? Swoon! They are part of a new die collection named Snow Flurries! Aren't they beautiful? Two more days until the release! Woot! Love ❤️ ME your products are always spectacular! Releases never disappoint. 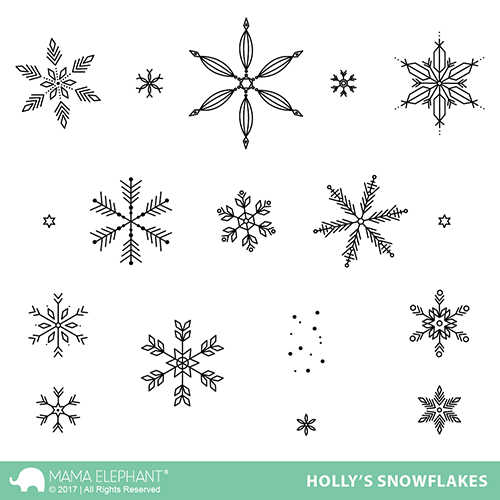 Holly's Snowflakes are so pretty, folksy without looking doodle-y — so many snowflake sets look too sketchy to be natural, but these are lovely. I especially like the smoky blue ink Kryssi used. Sweet! My favorite today are those cute little scallop boxes! I LOVE all Mama Elephant products and it looks like I will be buying a lot...again! That little Santa and reindeer are so cute it is unbelievable! Super cute!!! Love those little snowflake boxes!!! Oh my goodness !! Too many beautiful products again today !! The Snow Flurries die is impressive, just as the Bowtiful one, and those Scalloped Squared Boxes ??! Cutest boxes ever !!! Awesome projects; love the little treat boxes!!! I need that Holly's snowflakes in my life! So pretty!